There is more than one way to fit engineered hardwood floors; however, you always need to start by levelling your floor. Solve all the anomalies in advance, such as figuring out how you will deal with transitions. On concrete, boards are often glued (if moisture-free). Engineered wood flooring is usually pinned to wooden sub-floors; alternatively, you can ‘float’ your new floor over both, meaning it is not fixed down. Unlike laminates, engineered boards usually have their tongue and grooves reinforced with adhesive when floated. If you lack confidence, training schemes are available. 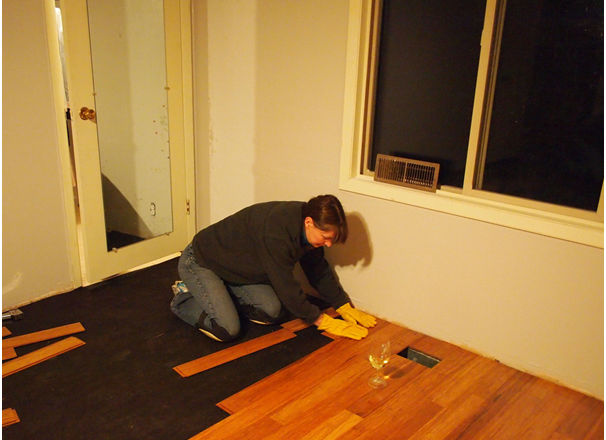 Remove the skirting, as the starting and finishing edges will be hidden when it is re-attached. Sweep and wash the floor, which must be completely dry before continuing. Open your packs of engineered wood flooring boards and mix or match. Packs can vary slightly in colouration and doing this will prevent the variation being noticeable. Boards should be stored where they will be fitted for at least two days to acclimatise to the conditions. There are several kinds of underlay, depending on your floor condition and fitting method. Tar paper is a good moisture barrier, while others provide some thermal or acoustic insulation. There are peel and stick varieties and types recommended for floated floors. Suppliers such as http://www.ukflooringdirect.co.uk/engineered-wood-flooring will be able to advise you. A floated floor requires a small expansion gap around the edges of the room to expand into as humidity and temperatures change. Even if you are fixing to the sub-floor, using temporary wedges to create an offset is still a good idea to avoid unevenness of the walls. Skirting or mouldings conceal this gap. Divide the width of the room by the width of the boards to check the space for the final row. If this is less than 60mm, trim the first row so that the last can be wider. Align the first row against the longest wall, tongue inwards, and stagger the seams in subsequent rows. Cut lengths using a set-square and a fine-toothed saw – this is important! Tongue and groove slips together when tilted slightly and you can tap lightly with a rubber mallet. To fix, use a pneumatic stapler with an angled head at 45-degrees, pinning through the grooves every 7”. Finally, refit the skirting or moulding.